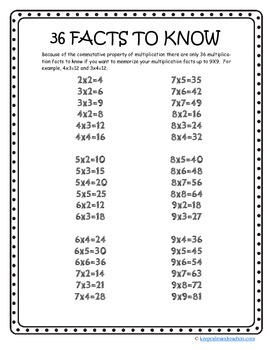 36 Multiplication Facts To Know by keepcalmandteachon.com. 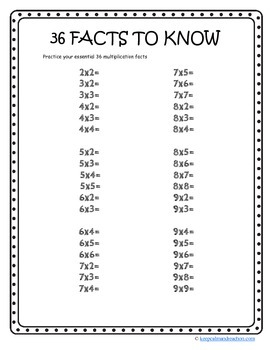 A useful handout and practice sheet for students to practice their multiplication facts up to 9x9 using commutative property as an advantage to memorize multiplication facts. When commutative property is taken into account there are only 36 different multiplication facts for students to memorize to master their facts up to 9x9. The practice sheet can be used for morning work/drill.